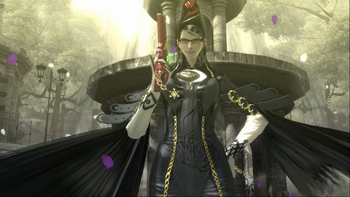 Platinum's Atsushi Inaba admits that lack of experience hindered the Bayonetta PS3 port. Bayonetta was one of those games you either loved or hated, but the PS3 version got a lot of stick for its slowdown, frame rate and loading time issues. Platinum Games' director admits that the problem was all Platinum's fault, and calls the PS3 Bayonetta conversion "our biggest failure." "At the time we didn't really know how to develop on PS3 all that well," says Inaba, "and whether we could have done it... is irrelevant: we made the decision that we couldn't." So rather than tackle it themselves, Platinum handed it over to an in-house Sega team. The result was the somewhat problematic port that could easily have been a deal-breaker for many players. "One thing I will say is that it wasn't a failure for nothing," Inaba went on to say. "We learned that we needed to take responsibility for everything." Platinum started looking for a new home for Bayonetta shortly after the conclusion of its five-game deal with Sega. Hence the exclusive deal with Nintendo for a Wii U Bayonetta 2, rather than further partnership with Sega. Given Sega's financial troubles and what Inaba has said about the Bayonetta PS3 port, it's hardly a shocker that Platinum would prefer another console for the next Bayonetta game.